Bringing people together is our specialty, so when progressive high schools, colleges, and universities realize how well a video game event can bring students together in a positive way, ideas truly come to life! Jet Set Studio partners with a wide variety of great organizations throughout North America. Corporate events and large-scale eSports tournaments have always been areas where our team has excelled, but lately our focus has really been geared towards building interactive events with great educational organizations. The Jet Set Studio brand vision makes partnerships with educational organizations special, but let’s look at a few specific reasons an event at your school might be something to consider this year. Educational leaders are always looking for sharp ways to bring students together in a positive way. One example of how this has worked for Central Michigan University, is how we’ve partnered with Central Michigan University for over five years to provide an exhibition video game element within a larger freshman orientation event they call Leadership Safari. Students have the option to chose from a variety of activities and our gaming event is always a hit. Whether it’s a freshman orientation or an event to enhance an existing tradition at your school, it’s amazing to see students and faculty come together to enjoy some friendly competition in a healthy and fun environment. Along with bringing students together, we’ve seen our events generate great visibility for our clients within their communities. Take Columbia College for instance. They were inaugurating a new President and wanted an innovative way to bring the campus together while also showcasing their vision for the future. By partnering with Jet Set Studio, we were able to develop a Madden 15 tournament for students that caught the eye of the nation. As a bracket of 48 students came to a close, the winner competed against the new President for a year’s worth of books. This one-day event generated outstanding attention to our client’s progressive vision and the college itself. Along with great visibility, with an event that ran to perfection, we were also able to establish an annual event that both the entire community of Columbia, Missouri will look forward to every year. Educational events often requiring less equipment. 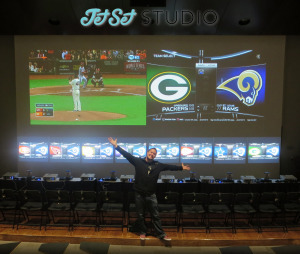 Jet Set Studio can provide a variety of video game equipment, but we also find smart ways to utilize your savvy staff, cool venues, and existing audio and video resources to optimize your bottom line. In some cases, we’re able to build ideas to be so sharp, the event becomes a unique fundraising opportunity! Take the District School Board of Niagara in Niagara Falls, Canada as an example. In 2012 we supported their goals of building a regional video game tournament that would support education and charity fundraising efforts, as well as, bring their community together in a big way. The result was UGC Niagara and after three years, the District School Board of Niagara has an annual, full-scale eSports event that draws hundreds of participants from all around North America to compete in a variety of different game divisions! In conclusion, Jet Set Studio partners with progressive educational organizations to develop interactive events that offers affordable innovative ways to entertain, connect, and engage your students, faculty, and community overall. We’d love to hear your ideas and invite you to contact us to learn more.